This amazing Mikado silk gown is a reproduction of a gown worn by a Spanish princess, found in a museum. The unusual seam lines of this gown give it it's unique shape, and the 12 foot train create an aura of splendor. Lavish hand embroidery including raised bullion roses, were worked in three shades of metallic gold thread. A modified Elizabethan collar and flared cuff were embellished with embroidery also. 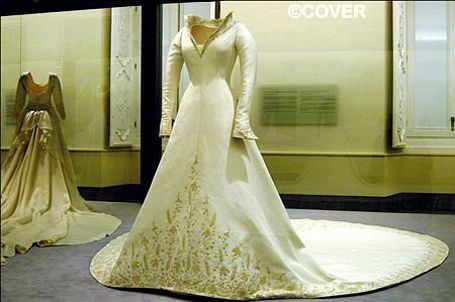 The gown displayed in the last picture was the original garment. It is on display in a museum. I created this gown from pictures from the exhibit.